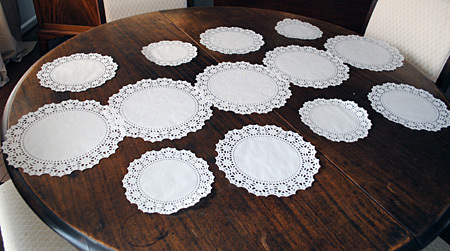 This is a cute Paper Table Runner that I made out of Doilies! 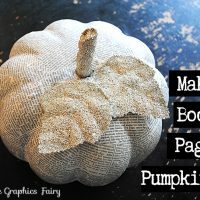 This easy project would be great for Weddings, Parties, or Holidays. 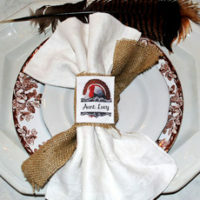 Nice for your Easter Table too! 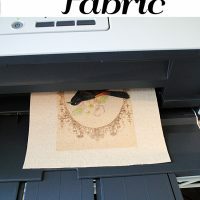 You could make a plain white one like I did here, or use color or metallic doilies, or you could even add some fun graphics or monograms to the center of each doily! 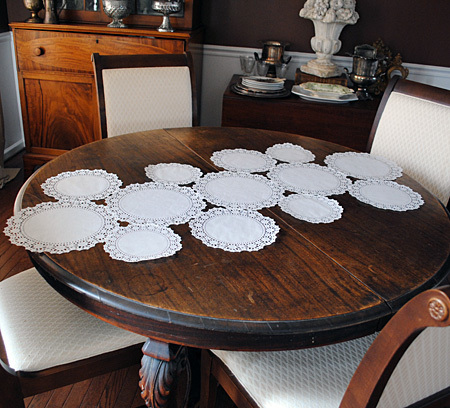 I even made a few matching Doily Place Mats to go with the runner! 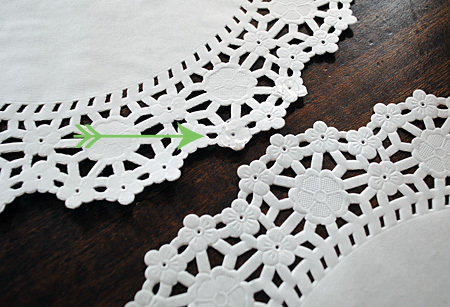 Step 1: Lay out your largest Doilies first. These were about 12″ wide each. You will build from here out. Step 2: Fill in with the medium and smaller Doilies until you get a configuration that you like. I wanted mine to be slight asymmetrical. Step 3: After you get the lay out that you want, carefully spread the doilies apart, but keep them as close to your configuration as you can, so that you don’t loose your design! 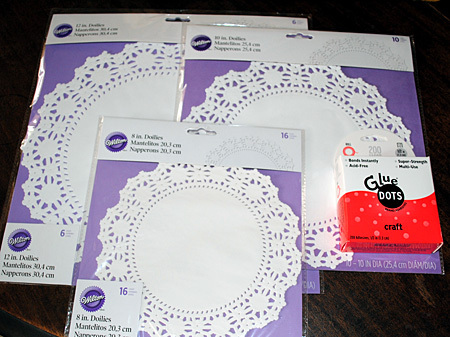 Step 4: Using the Glue Dots, attach the Doilies together. I attached all the largest ones first. I just placed a dot or 2 on the outer edges. 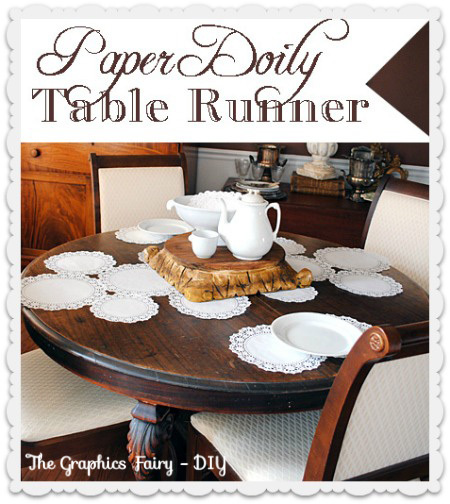 Make sure you don’t glue the doilies to your table!! Woohoo! That’s it! Simple and pretty, but you can embellish it if you like. You could make a bunch of these in advance for a Wedding and take them all down to the reception, already put together. You can layer some accessories on top for added interest. Nice for a Tea Party too!! Very clever and so easy! Saves having all those loose doilies floating aroundafter the festivities! Also sve the dog choking on ones that end up on the floor!! Simple and so lovely! I could make a bunch of them 😉 Thanks for sharing! So simple and a great idea for a quick special look! 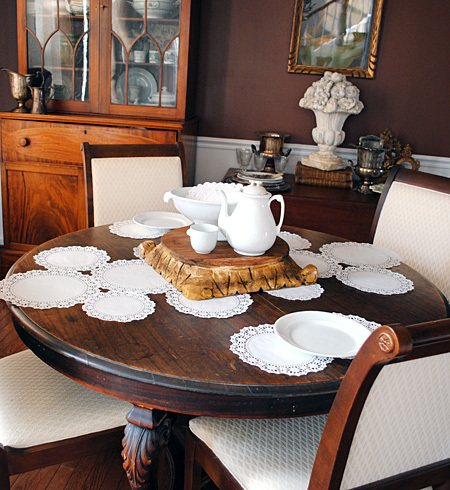 No linens to wash but MUCH better looking than a paper tablecloth! Thanks Lorraine, I’m glad you like it!! Thank you Keren! I love them too! 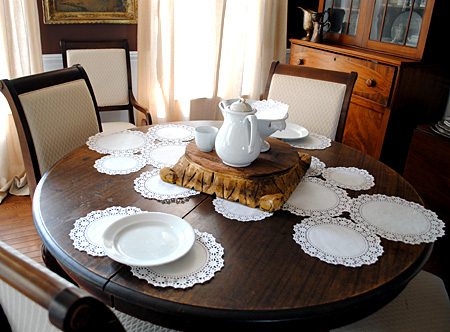 I am a big fan of doilies and vintage linen, this is perfect for me. Thank you so much for sharing. Yay! Thanks Pamela, I’m glad you liked it! !